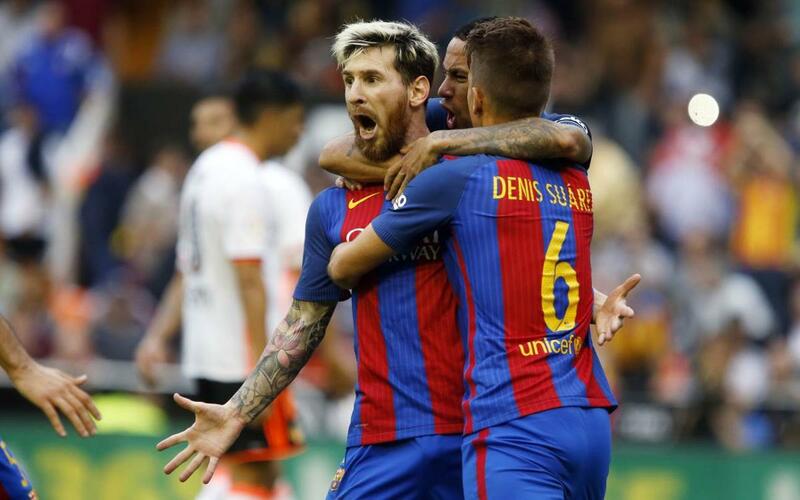 Barça have escaped with all three points from an adrenaline-charged encounter in Valencia that wasn’t decided until the very last second. An intense ninety minutes saw both sides come from behind, and although there was plenty to celebrate, the negative note was a serious injury suffered by one of the team’s most important players. On Wednesday it was Gerard Pique and Jordi Alba and today it was Andrés Iniesta who was forced to make an early exit, picking up a nasty looking knee injury from a clash with Enzo Perez. That setback came after a first quarter of an hour bereft of any clear pattern, with the two goalkeepers mere spectators along with the near-capacity Mestalla crowd. The first shot on target came after 22 minutes. It was also the first goal. And once again it was that man Leo Messi, pouncing on an Ivan Rakitic assist to stroke the ball home – albeit amidst protests from Valencia keeper Diego Alves that he’d been unsighted by Luis Suárez standing in an offside position. It was Alves who kept the home side in the game as Barça pushed forward in search of more. His save to deny Messi was good while the two against Suárez at point blank range were even better. At the other end, Ter Stegen was having a far less troubled 45 minutes, only really being called upon to throw himself in the way of Dani Parejo just before the break. In an increasingly more physical and chaotic encounter, and while the home supporters were venting their fury against the referee, Barça had kept their cool and concentrated on getting the job done – and were fine value for their 1-0 lead at the interval. In what could have been a Barça substitution not so long ago, Munir replaced Montoya for the restart as Cesare Prandelli sought more sting up front. And although the first chance fell to Barça as an unmarked Rakitic drove the ball onto the post, the Valencia substitute only needed seven minutes to get on the scoresheet. It was a terrific one-touch strike from the edge of the area, perfectly placed out of Ter Stegen’s reach. But the player who is still officially on the FC Barcelona books respectfully restrained himself from celebrating his first official goal for his loan club. The ball was barely rolling again when Valencia made it two. Nani deftly flicked the ball over the Barça defence and Rodrigo converted with his left foot. Barça had things to sort out, and halted the Valencia charge in the best possible manner. Rakitic’s header was parried away by Alves but Suárez was swiftly on the rebound. Smack! 2-2! This was pulsating, edge-of-your-seat, heart-pounding football and there was still half an hour to go! Both sides could smell victory. The action was relentless at both ends of the pitch, and although Barça were generally more on top of the game, it was Valencia who came closest to a third when Nani’s thunderbolt struck Ter Stegen’s side-netting. As the game headed into injury time, it looked like the spoils were going to be shared. But there was one more twist in this gripping tale to come. Aymen Abdennour brought down Suárez in the Valencia area and the referee’s finger was immediately directed towards the penalty spot. It all came down to the world’s greatest player, Messi, against LaLiga’s penalty saving king, Alves. Messi did his job. Three extraordinarily hard-earned points were in the bag – and we could all finally breathe again. As an added bonus, the result also puts Barça top of the league, at least until the Sunday fixtures have been played.